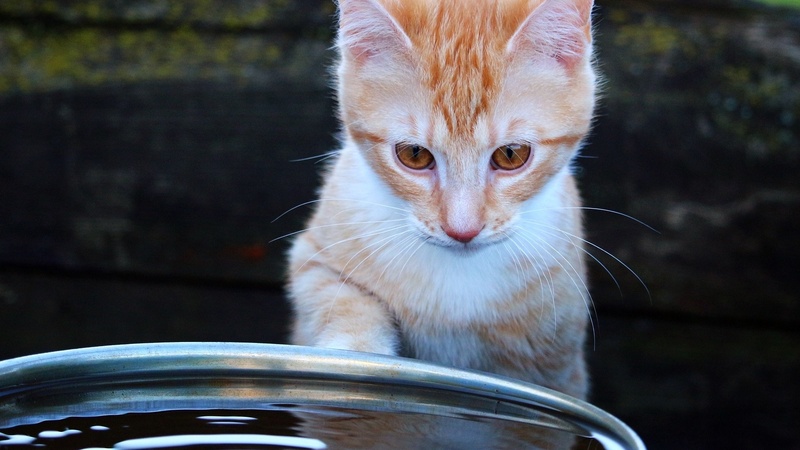 Is your cat drinking enough water? Honestly, there’s probably a good chance that you don’t really know because you rarely, if ever, actually see them go drink from their bowl. Like many of cats’ peculiar quirks, their drinking habits (or lack thereof) trace back to their early days as desert hunters. These ancient cats would get most, if not all of their water from their prey, such as mice and other rodents. Modern cats maintain these habits, making it potentially stressful for a human who wants to make sure their cat is getting enough water. And these days, cats get far less moisture from their food, considering that many are fed a dry-food diet containing only 6–10% moisture, a fraction of the moisture they'd get from rats and mice or canned food. Combine a cat’s ability to hide signs of health problems with their typically finicky drinking habits, and you can find yourself with a dehydrated cat fairly quickly. Typically, cats need between 3.5–4.5 ounces of water per 5 pounds of body weight per day. If you have a 10-pound cat, they should be consuming between 7–9 ounces of water, or about half an average bottle of water. The key word here is “consume,” since cats don’t need to get their water just by drinking. 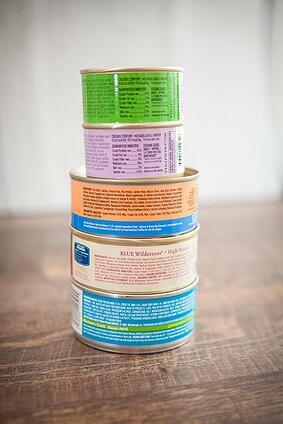 A can of wet food is about 70–80% water. So if your cat is eating wet food, which is highly recommended, they might get between 3.85–4.4 ounces of water from a single can (an average 5.5 once can). That’s half their daily water right there. Wet food can be highly beneficial for many reasons, not the least of which being that you know a cat eating wet food is at least getting some of their needed daily water. Because if your cat is home all day, you might not actually see them drinking, but there are ways to tell if they’re not be getting enough water. 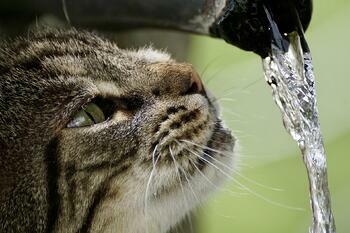 You can’t judge a cat’s water intake based solely on the amount of water you see them drink. If your cat is on a wet food diet, they probably won't have much need to drink additional water anyway. And when they do drink, it could just as easily be when you’re away from home or even when you’re asleep. Instead of trying to catch your cat in the act, focus on monitoring the trends of the water level in their bowl at the end of the day (or beginning of the next). When you clean and refill their water bowls each day (which is recommended), take note of how much is left over. Just make sure to fill the bowl to the same level each day so it's easy to tell when there's a significant change. It can be hard to tell whether your cat is actually dehydrated simply by their water intake. To know for sure, check for these signs. Loose Skin: If you gently "tent" (pull up) a bit of your cat's skin over their shoulders, it should quickly return back to normal positioning once released. If your cat is dehydrated, their skin will slide back more slowly. The “skin tent test” can be one of the best ways to check for dehydration at home. However, it isn’t perfect, as your cat’s “skin tent time” is greatly affected by their level of fat and muscle under the skin in the area where you performed the test, as well as the overall health of their skin. Sticky Gums: Dry, tacky gums can be a sign of dehydration. If a cat's gums are moist and not "tacky" (sticky), then they're more likely to be well hydrated. Depression or Lethargy: Check whether your cat seems especially sleepy or lazy. Are they less likely to greet you when you come home? Are they less playful than usual? Pay attention to these changes in behavior. Loss of Appetite: When a cat won’t eat, it is often an immediate signal that something is wrong, even if it’s not dehydration. If your cat refuses to eat for more than 24 hours, it’s time to go to the vet. Vomiting or diarrhea: Though not signs of dehydration itself, a cat that is vomiting or that has diarrhea will quickly become dehydrated. Sunken Eyes: A dehydrated cat might appear sullen or drowsy, with sunken eyes or eyes that look somewhat “dull." Elevated Heart Rate: Take a pet first aid course, or at your next vet visit ask your vet or clinic technician to show you how to check and measure your cat’s heart and/or pulse rate so you know whether it is higher or lower than normal. Panting: Cats don’t often pant, but they might when overheated, which may go along with a case of dehydration. Less Urination: Here’s yet another reason why you should scoop your cat’s litter boxes daily: So you can check for changes in urination (and defecation). Also remember that a cat that isn’t peeing might not be able to, which can be the sign of a fatal urethral obstruction. If you believe your cat is dehydrated, encourage them to take in more water (see the tips and tricks below). If their dehydration is mild and their kidneys, intestines, and other organs are working normally, then the additional water they take in “orally” may be enough to help correct the problem. However, if their dehydration is more advanced, or if they’ve got underlying disease or dysfunction with one or more of their body systems, then it’s time for a vet visit. Your vet can determine how dehydrated your cat is and help you get to the bottom of it. They can also give your cat “fluids” — a balanced electrolyte solution. Dehydration isn’t just about an abnormality of water balance, as there are typically electrolyte imbalances, too. Fluids may be administered either subcutaneously (under your cat’s skin) or intravenously (directly into your cat’s vein), depending on how dehydrated and sick your cat is. If you’re worried about your cat’s water intake, even if they’re not showing signs of dehydration, try one or more of the following tricks. Find the Flavor: Add a little bit of tuna or clam juice, or low-sodium chicken broth (straight broth that does not include onion or garlic.) to their water. Switch it Up: Switch from dry food to wet. As mentioned above, cats are accustomed to getting most of their water from their food. You can even add a bit more water to the canned food, to make it more of a gruel consistency (don’t make it too soupy). Chill Out: Place a few ice cubes in their water bowl. Many cats are fascinated by the sound and look of bobbing ice cubes, and will happily go in for a few laps. More Bowls (and cups, glasses, and mugs! ): This is especially true if you have multiple cats, as the smell of another cat will discourage them from sharing the same water. But, generally speaking, it’s good to have multiple things for your cat to drink water from spread throughout your home to tap into a cat’s water wanderlust. Scrub a Dub: Clean your cat’s water bowl daily to remove any unpleasant odors and potentially harmful bacteria. They should have fresh water in their bowls and glasses daily. Change the Source: If your cat isn’t digging your tap water — hey, they’re finicky after all — try filtering it (Brita or a pet-specific bowl-side filter) or switch to bottled water.